Turtle Back Zoo, Savannah Café | Cost of Wisconsin, Inc.
On May 2nd, 2016, Essex County Officials had the distinct pleasure of cutting the ribbon on the Turtle Back Zoo’s Savannah Café. This $6,000,000 investment offers its patrons a first-floor dining area that is about 9,125 square feet with seating for 106 people, second floor dining with an enclosed 2,000-square-foot dining area and a 5,125 square feet outdoor terrace with total seating for 266 people. Special events and parties will be available on the 2nd floor. As guests stroll up to the Savannah Café, they are greeted by a sculpted 150-foot long Ball Python Snake. The python’s massive head is nearly 7 foot long by 4 foot wide. The snake’s body serves as a retaining wall within the planter pocket. The sculpture offers great photo opportunities, or simply an interesting seat for a quick snack eating. COST was hired in fall 2015 to provide shop drawings and to fabricate the python sculpture. The Glass Fiber Reinforced Concrete (GFRC) reptile was then shipped to West Orange, NJ. The snake was carved out of EPS foam at COST’s 144,000 sq. ft. plant in Jackson, Wisconsin. Afterwards, GFRC structural coat was applied to the EPS foam. Once completed, COST’s artisans applied a finished coat and sculpted a 3” x 3” scale pattern. The team used various paints and stains to achieve the desired effect. 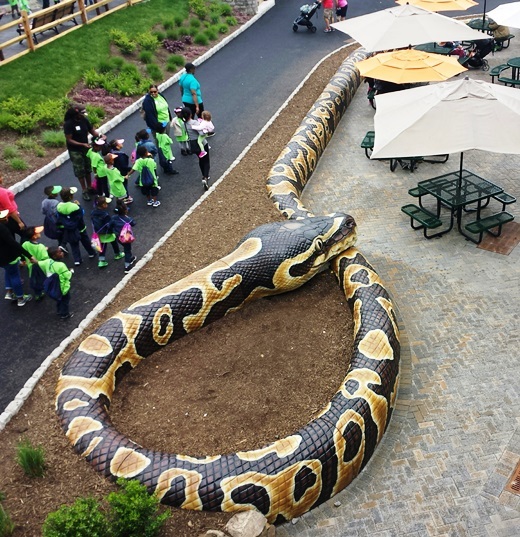 Essex County Executive Joseph DiVincenzo, Jr. recently stated, “[w]e are always looking for new ways to enhance our visitors’ experience when they come to Turtle Back Zoo.”* A 150 foot long python is certainly one of them.